Certified Events & Wedding planner – Dionne Dennie (Left), with an extremely happy couple (right), who came to St. Vincent to get married. We know that many persons may consider getting married in St. Vincent and the Grenadines, if they decide to take runaway and do something different. 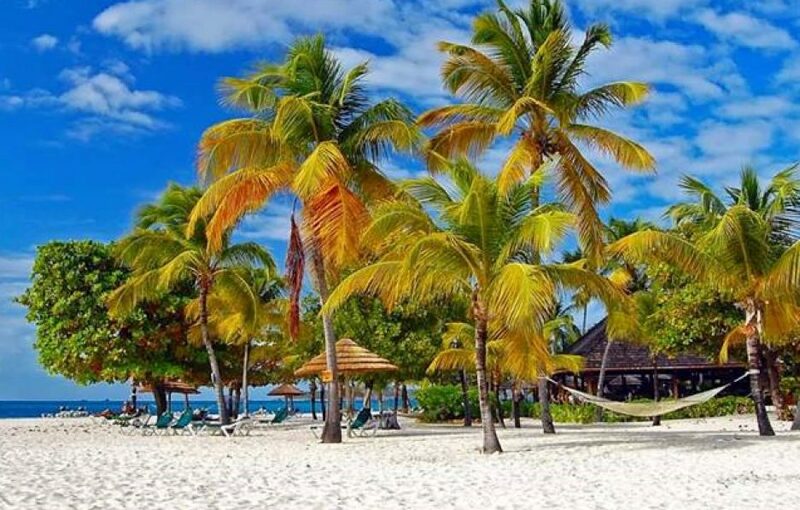 We contacted the leading Events & Wedding planner in St. Vincent & the Grenadines, Laurel Dionne Dennie and asked her for her opinion on 10 great wedding venues, mainly outdoor ones. Dennie, is Co-founder and Chief Planner at Exquisite EventSVG, the leading events planning firm in SVG. She and Recardo Jackson (part owner of the company) have revolutionized Event planning, locally. Dennie, is a trained events planner and coordinator. Jackson, is a local Marketing and Promotions expert. There is hardly a suitable venue in SVG, which has been untouched by Dennie and her Team. She has also organized weddings, parties, cocktails and other events for high profile companies and people. Spring Gardens Estate, Biabou: Spring Gardens Estate, is arguably the best wedding venue on mainland St. Vincent. Spring, gets an A+ for general aesthetics and has two main areas for hosting your wedding reception. There is a lovely Mahogany Bar, next to a Pool and a Hotel on the property, if you wish to house members of your bridal party, or to Honeymoon there. 2. Grenadines House: This place has a unique view, overlooking the Capital city, Kingstown. It has a pool (if you want that pool side wedding experience) and an indoor area, as well as a lovely outdoor area to host guests. There are also lovely rooms, so you can have your honeymoon there as well. 4. Grand View Hotel: The views seen from this place, is testimony to its name. Two Bar areas, a pool and three open spaces for holding events, makes it incredible. 5. Fantasea Tours (gazebo area): Spacious, beautiful, spectacular views…..
6. Bequia Beach Hotel: Go to the Hotel’s facebook page and read the reviews and see the scenery for yourself. 7. Balcombe’s Estate at India Bay: This is one of the most picturesque Garden areas on mainland St. Vincent. It gets high grades for general aesthetics and also accessibility. 8. Rawacou Recreational Park: Spacious and stunning! 9. Montreal Gardens: This place is literally heaven on earth! Seasons greetings and thank you for your comment. We recommend that you contact certified planner – Laurel Dennie of Exquisite Events SVG at exquisitesvg@gmail.com or at their website http://www.exquisitesvg.com/ for more information on this request. We wish you all the best in your plans.